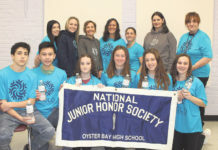 The Oyster Bay High School (OBHS) chapter of the National Honor Society recently inducted new members in a beautiful candlelit ceremony in the high school performing arts center. The evening was organized by Honor Society faculty advisor Scott Knapp. The officers of the OBHS Honor Society are President Evan Mattel, Vice President Kevin Duke, Secretaru Jed Kaiser, Treaasurer Jodi Yeh, Historian Amanda Byrne and Publicity Officer Nicole Ojeda. 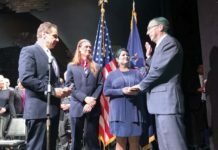 Ojeda led the audience in the Pledge of Allegiance followed by Superintendent of Schools Dr. Laura Seinfeld welcoming the audience and congratulating the new inductees. The officers of the Honor Society each lit a candle in turn and spoke of a trait that exemplifies a member of the National Honor Society. Candles were lit to signify the eternal light of scholarship, leadership, character and service. Oyster Bay High School Principal Sharon Lasher administered the pledge to the new inductees. The 2017 inductees of the National Honor Society from Oyster Bay High School are Zachary Arenella, Jacqueline, Baxter, Michael Biggiani, Liam Colvin, Sarah Conway, Thomas Coor, Mikaela, Cornelious, Mary Ford, Isabella Furman, Malachy Golon, Lindsay Gorney, Jason Hom, Miranda Hutchinson, Reilly Iles, Sophie Kaiser, Lindsey Kowalczyk, Shania Kuo, Emily Lattanzio, Victoria Lattanzio, Jessica Layne, Elina Leandrou, Alexandria Lizza, Hannah Lopes, Leonardo Mangano, Margaret McNamara, Ryann O’Keefe, John O’Neill, Kaitlin Pellechia, Carolyn Poppe, Alyssa Quintana, Giovanna Ranaldo, Benjamin Rivera, Isabella Rosenthal, Michelle Ruzzier, Rachel Sabatello, Jennifer Sanchez, Emily Sarli, Julia Sherbal, Julia Tauter, Kyra Tischler, David Wiesenfeld and Robert Zahradnik. The inductees join the current members Lance Amarilio, Laura Angelone, Nicholas Baratta, Bradley Beck, Brittany Browner, Andrew Busch, Terrance Cameron, Jack Casey, Keith Cassar, Matilde Catarino-Bechet, Gabrielle Cornelious, Kate Devereaux, Matthew DiCarali, Danielle DiMeo, Aidan Doxey, Ashley Duggan, Maggie Frankel, Alexandra Gagliardi, Cristian Garcia, Alexander Gelabert, Daniel Gelabert, Lena Gluck, Gigi Grady, Maxwell Greenspan, Ian Guarini, Ashley Hazan, Emma Ingoglia, Jenna Jarrah, Colleen Joyce, Daniel Juhasz, Kimia Khaledi, Kaela Kilfoil, Ashley Kowalczyk, Courtney Kowalsky, James Losee, Krista Marino, Cassandra Matthews, Owen McEvoy, Emily Moore, Elaine Mylonas, Bella Pace, Jason Plaia, Jennifer Rebuth, Juliette Rebuth, Aaron Rudnet, Caroline Scamell, Tyler Scognamiglio, Allison Suttenberg, Lauren Suttenberg, Jessica Thienel, Katherine Thompson, Lindsey Tiberia, Maria Torti, James Treiber, Pavlos Tsoumpariotis, Julia Vicari, Derek Vickers, Victoria Vigliotti, Jack Wieboldt, Jonathan Wong, Patrick Wygand, Sahill Yadav, Michelle Yu, Owen Zahradnik amd Nicholas Zucconi.